Why start with travel buses? Why are travel buses a great place to start incorporating lap-shoulder seat belts on your district’s school buses? Because with more risks should come more protection. Travel buses are used for field trips, sporting events, and school activities that take school buses off of neighborhood streets and onto interstates and highways with speeds of 55 mph or more. Another reason is cost. Most districts can’t afford to outfit all their buses with lap-shoulder belts at once, they need to phase them in. Starting with the buses that travel at the highest speeds and cover the greatest distances just makes sense, both for the protection of the children, and for the district’s limited finances. Will the addition of lap-shoulder belts affect school bus capacity? Before SafeGuard introduced FlexSeat in 2007, seat designs that included lap-shoulder belts took away flexibility and reduced overall bus capacity by forcing the choice of seats with either two or three positions. Because of this constraint, school transportation directors were forced to purchase additional buses, reduce routs, or change routes to optimize the use of their buses. The introduction of the SafeGuard FlexSeat alleviated these concerns by offering flexibility of transporting either two or three children on every seat, while ensuring they all have lap-shoulder belts. What states require seat belts on school buses? California (2005) and Texas (2010) require lap-shoulder belts on new buses. New York, New Jersey, and Florida require at least lap belts on new buses. Each year, between 20 and 30 states have bills calling for seat belts to be mandatory on new school buses. Most proposed bills are driven by local grassroots activity. Will children wear lap-shoulder belts on school buses? Children come out of the hospital buckled in a car seat. They’re conditioned from birth to be belted while in a moving vehicle. Pilot studies and field studies have shown that with properly administered policies in place, compliance rates are very high. As with any other bus behavior policies, seat belt usage policies must be actively communicated for the safety of the children. 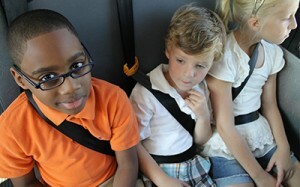 Will lap-shoulder belts improve child behavior and reduce bullying on school buses? 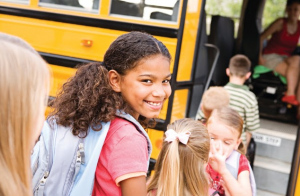 While the safety advantages of lap-shoulder belts usually push school districts to move ahead with lap-shoulder belts, transportation managers and drivers say the behavior benefits are the most significant daily impact they see. Children are less inclined to move around in their seats, stand while the bus is moving, or talk to those several rows away from them. 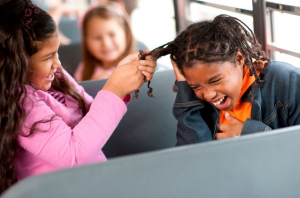 There is no greater deterrent to bullying and unruly behavior than keeping children in their seats. Additionally, when children stay in their seats, drivers are less distracted, further improving safety on the school bus. Can lap-shoulder belts be used as weapons? In the past, some lap belts were designed with a massive steel buckle threaded on a long web, making it possible to swing them. Modern lap-shoulder belts use retractable systems for the lightweight tongue. As with most passenger cars, the buckle is attached to the seat with a short piece of webbing, making them impossible to swing. How will students get out of lap-shoulder belts if there is an accident? Evacuation training is essential for all students riding a school bus, whether or not the bus is equipped with restraints. Training prepares children to respond calmly in the event of an accident. Students are less likely to be injured in a bus accident when they are wearing restraints. A properly restrained child who has not been injured can release and evacuate more quickly than one who requires a stretcher for evacuation. Buckles are designed and tested to unlatch with the push of a button, even in a bus rollover. Fully loaded federal motor vehicle safety standards require that the force needed to push the button on a buckle be less than 14 pounds. In an emergency, the most significant limitation to evacuating a bus is the design of the emergency exits. A large number of evacuees must move through a single-exit door, one at a time, to the outside. In an accident, this process creates a greater timing challenge than the few additional seconds required to release restraints. How will students evacuate from a bus with lap-shoulder belts if the accident involves fire or deep water? As noted in the response above, a properly restrained child who has not been injured will have a much easier time evacuating in any type of accident. Evacuation training is essential for all students riding a school bus whether the bus is equipped with seat belts or not. Training prepares children to respond calmly in the event of an accident, and the key element in a quick evacuation is uninjured, conscious passengers. In an accident without belts, the risks of injury and unconsciousness increase greatly. What is the best way to advocate for seat belts on my child’s school bus? Becoming an advocate for seat belts on school buses is easy. The first place you should start is with the information provided on this website. Share it with other concerned parents and make sure to tell them that the facts and research show that seat belts greatly improve your child’s safety. You can share information through word-of-mouth, but social media also provides a great opportunity to spread information. There are lots of other ways to advocate: Talk to the PTO/PTA of your school district. Email or write your school district’s transportation director and superintendent. Contact your state legislators. Or join a community of concerned parents like the SafeGuard4Kids Facebook group. You can learn more about ways to get involved here. And you can also request an Advocate Kit here. 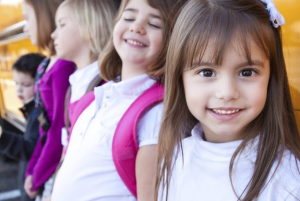 What is the average cost of adding seat belts to my child’s school bus? 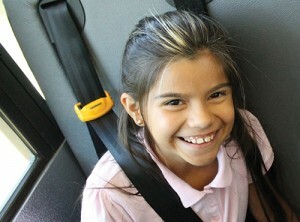 Adding seat belts to school buses costs just pennies a day. SafeGuard seat belts are reliable and long lasting, so they don’t need to be replaced every few years. A small expense is a tiny price to pay when compared to the value of keeping our kids safe. What do school bus drivers think of school bus seat belts? The school bus driver response to using SafeGuard lap-shoulder seat belts has been overwhelmingly positive.